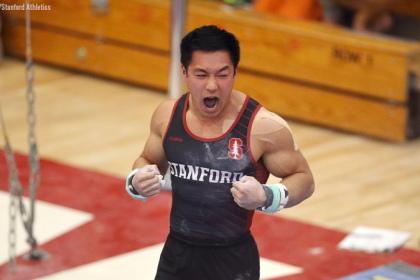 The Big Ten Conference is both the biggest and deepest conference in NCAA men’s gymnastics. All seven teams qualified to last season’s NCAA championships and finished in the top 10 of the final team standings. This will be a competitive year once again for the conference, with multiple teams capable of winning the Big Ten championship and all teams being able to beat one another on any given day. Illinois will be aiming to defend its conference title from last year, but don’t count out Penn State, Ohio State or an experienced Michigan squad to knock it off its pedestal. Minnesota will be looking to carry the momentum from its NCAA championship runner-up finish, but the losses of many key seniors from last season leave a lot of openings in its lineups. Nebraska and Iowa will both be trying to improve upon their recent seasons that have had them finish lower than they had hoped for, but when both are hitting their full potentials, they are capable of defeating any team who gives them the chance. The loss of Bobby Baker will be a tough obstacle for Illinois to overcome this upcoming season asit hopes to repeat as Big Ten champions and improve upon its third place finish at the NCAA championships. Baker’s graduation leaves the role of reliable all arounder vacant, and the Fighting Illini could potentially have an answer with senior Johnny Jacobsen. Jacobsen competed in the all around a few times last season and was a regular on all but pommel horse and high bar. 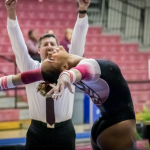 Senior Alex Diab, the reigning Big Ten and NCAA rings champion, is a standout on both rings and floor but will be in the conversation for the vault and high bar lineups this season as well after the losses of several postseason routines on those events. Illinois will also be awaiting the debut of sophomore Clay Mason Stephens, a member of the Australian national team who did not compete last season. Freshman Michael Fletcher should also factor into the lineups on a few events. The Hawkeyes bring in a big freshman class for the 2019 season as they look to return to the team finals at the NCAA championships for the first time since 2015. With nine new additions to the roster, the Hawkeyes shouldn’t have much of a problem replacing the 12 postseason routines they lost to graduation. Sophomore Bennet Huang will look to continue being the team’s premier all arounder after a promising freshman campaign where he advanced to the second day of the NCAA championships in the all around. Also watch for freshman Evan Davis to potentially become an all arounder as well, as he’s coming off an eighth place finish in the junior division at this summer’s U.S. Gymnastics Championships. After claiming back-to-back NCAA team titles in 2013 and 2014, the Wolverines have placed no higher than eighth over the past three seasons. Michigan is returning all but four routines from last season’s nationals lineup, so this team should be able to build upon its results from last year just by being an experienced team. Sophomore Cameron Bock will look to emerge as an NCAA superstar after a stellar summer that saw him win five medals at the 2018 Senior Pan American Championships, including team gold and all around bronze. Freshman Kevin Penev will also help make an immediate impact on Michigan’s floor and vault lineups. Last season the Golden Gophers relied heavily on their seniors to accomplish one of their most successful seasons in recent years. That senior class helped Minnesota steadily climb up the ranks each year, placing seventh at the NCAA championships their freshman season and placing second only to the Oklahoma dynasty their senior season. It’s no question that Minnesota will dearly miss those 10 individuals. Helping alleviate the losses is sophomore standout Shane Wiskus, who placed second in the all around at the NCAA championships last season and was named Big Ten Freshman of the year. A large incoming freshman class will also be beneficial to Minnesota, but it will need all to be contributing routines from the start to help Minnesota stay near the top of the rankings this season. Nebraska has been steadily improving its finish at NCAA championships over the past few seasons, placing 10th, seventh, sixth and fifth over the past four seasons, respectively. They are in a similar situation to Minnesota, needing to replace many key routines lost from graduated seniors. Thankfully, they are bringing in a large freshman class capable of producing lineup-ready routines. The Huskers’ star this season will likely be senior Anton Stephenson, the reigning Big Ten vault and parallel bars champion, who can put up huge scores on five events. Sophomore Griffin Kehler was a key member of the floor, parallel bars and high bar lineups last season and has the potential to be a frequent all arounder for Nebraska in 2019. Ohio State is likely disappointed in its seventh place finish at NCAA championships last season after spending a majority of the season ranked in the top six. The lost of former U.S. national team member Sean Melton is a huge loss for the Buckeyes, but luckily a majority of their other key contributors from last season are returning. Senior Alec Yoder will be one of the stars of the NCAA this season after he represents the U.S. at the 2018 World Championships. Sophomores Max Andryuhschenko and Sean Neighbarger are two other Buckeyes to keep an eye out for this season, along with freshman Luke Smigliani. After finishing third at the 2015 NCAA championships, Penn State has been floating in the middle of the top 10 for the past few years. 2019 should be a strong season for Penn State, as it is returning all but two of its routines from postseason. 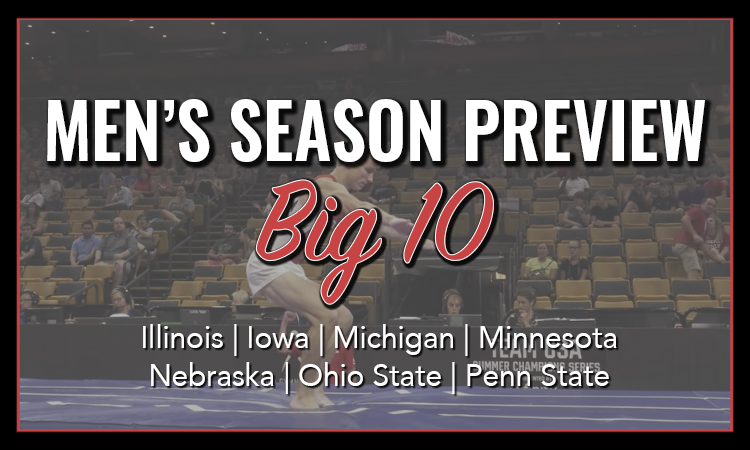 Two-time defending NCAA pommel horse champion Stephen Nedoroscik will be looking to three-peat on that event in his junior year and sophomore Brennan Pantazis will look to build upon an impressive freshman season that saw him win the Big Ten title on floor. Senior Wyatt Tyndall and junior Sam Zakutney, both Canadian National Team members, will also be ones to watch on this Nittany Lions team. 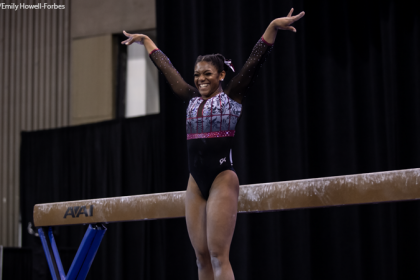 Zakutney helped Canada place fifth at the 2018 Senior Pan American Championships this summer. Greg Tamargo will be competing for PSU again. Greg Tamargo will be competing for PSU.